In the latest episode of the Chuck Lauer Show, presented by Alter+Care, the former publisher of Modern Healthcare discusses providing healthcare in a war zone with Rob and Lisa Werner, who spent nearly four years living in Afghanistan from 2005 to 2009 and working in healthcare. At first, the Werners settled in Mazar i Sharif, Afghanistan’s fourth largest city, where Rob worked in tuberculosis control. In that capacity he worked with community-based programs applying government initiatives to cure patients. After 1 ½ years, Rob was offered a job as advisor to the manager of a women’s hospital in Kabul to oversee a grant that funded the creation of vital new programs. Medical education is not entirely absent from Afghanistan. For example, there is the Kabul Medical University and a few smaller schools elsewhere in the country. The level of education they provide varies widely. Many aspiring physicians study in Pakistan because the facilities there are better, and there are more medical resources. 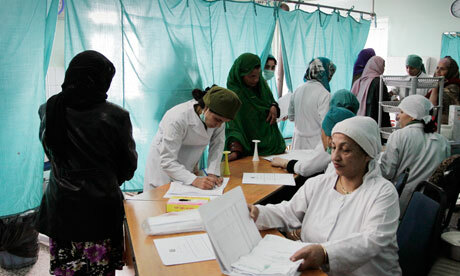 Afghani nurses tend to function as patient attendants and have minimal exposure to such disciplines as pharmacology. In the second episode of the Chuck Lauer Show, presented by Alter+Care, the former publisher of Modern Healthcare discusses enhancing patient outcomes with Paul Spiegelman, Founder and CEO of The Beryl Companies, and Dr. Jason Wolf, Executive Director, of The Beryl Institute. The Beryl Institute is the home for professionals committed to improving the patient experience and developing high performance healthcare organizations. According to Spiegelman, he began the business with his brothers in 1986 as a bootstrap 24/7 operation whose goal was – and remains — to improve the patient experience. Spiegelman provided outsourced call-center services to hospitals across the country to match potential patients with healthcare providers. Although many perceive call centers as a low-morale, high-attrition, low-margins, boiler room commodity operation, Spiegelman was determined to operate his business differently. Today, Beryl is the nation’s largest company in its niche and is five to six times more profitable than its competition. Additionally, employee attrition is a fraction of a typical call-center environment. Thanks to its circle of growth, Beryl has won nine awards for being one of the best places to work in America. Wolf suggests that one priority is to adopt a simple but specific definition of the patient experience as the sum of all interactions, shaped by an organization’s culture that influence patient perceptions across the continuum of care (The Beryl Institute). The focus is well beyond the clinical setting to the entire continuum of care. This encompasses how physicians act towards the patient and how effectively nurses communicate. A recent benchmarking study from The Beryl Institute has shown that patient experience and safety are top priorities for healthcare leaders, yet only one-third of all healthcare organizations in the U.S. currently define what a patients’ experience should be, one reason why it was important for The Beryl Institute to fashion its own unique definition. The Mayo Clinic ended 2009 with it best operating margin in five years after breaking even in 2008. With expenses virtually flat, the Rochester, MN-based healthcare system reported that its operating income totaled $333.2 million for the year ending December 31, 2009. Mayo Clinic, which recovered nearly all of its assets lost during the recession as its investments rebounded and its pension and retiree benefits limited its liability by $1 billion, according to CFO Jeff Bolton. Capital spending, which was cut during the recession, will slowly return to historic levels. Bolton said that Mayo spent $361 million on capital projects in 2009 compared with $500 million to $700 annually in normal years. The healthcare industry has lost its soul, and must return to its roots of healing people. This is the opinion of Charles S. Lauer, the retired publisher of Modern Healthcare magazine, best-selling author, and an acclaimed lecturer on leadership and success in the healthcare industry. In a recent interview for the Alter+Care Podcasts on Healthcare (hyperlink here), Lauer states that healthcare has become a business. As a result, hospital CEOs must have great financial acumen, but a focus on healthcare financial metrics can take a leader away from the core mission of healthcare. When asked to identify an individual who demonstrates real leadership in healthcare, Lauer cites Dr. Edward Eckenhoff, who is the founder, President and CEO of the National Rehabilitation Hospital in Washington, D.C. A paraplegic since a college auto accident, Eckenhoff is working to teach seriously injured war veterans how to walk again.